Erractic behavior, and unexplained system crashes during startip or operation. Perform a Visual inspection of the CPU. First, turn off the PC and open the case. Let the system sit for about 10 minutes or until the CPU is coolenough to touch. Clear away any obstructing wires, cables, or bays. 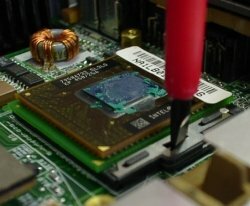 Check to see if any material was in direct contact with the CPU or its pins. Check the heat sink and fan. Are the fan wires attached (if present)? Are the heat sink fan properly secured to the CPU? Boot up the PC with the case off. Watch the CPU fan for activity. If it doesn't rotate, the probable culprit is overheating due to a malfunctioning fan. With the PC still runing, place your hand near the CPU fan, and check for proper airflow. Do the same near the power supply to see if that fan is working. Check the chassis to see if any cables or other objects are blocking the air vents. Turn off the PC. With your fingers, gently and evenly press along the edges of the chip. Notice if any movement occurs that might indicate that the CPU had come unseated. Check your system documentation to ensure that the CPU clock jumpers are set properly for the speed and model of your processor. Examine the CPU if possible. Check the silk screening on top of the unit or the etched makings on the bottom. Does the indicated CPU speed match what you're supposed to have ? If possible, boot up your PC and enter the BIOS program. Look for any discrepancies in the CPU and system settings. Compare the settings against the factory defaults in your documentation. In general, your best defence against CPU failure is prevention. Avoid overcrowding your PC's case or blocking air vents with books or papers. Also try not to jar the PC, because this can unseat the CPU or break the CPU fan. Periodically clean out the inside of your system box with a soft brush or compressed air. When fixing cpu problem make sure to take special care to ensure that the air vents on the power supply aren't blocked by debris. 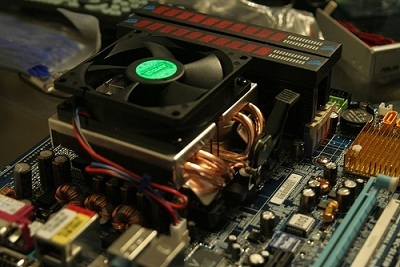 That simple problem will eventually lead to overheating, followed by failure of the power supply, fan. or CPU. You should be expecially conscientious about cleaning your PC's insides if the system sits in an area with pets or where poeple smoke. Both tent to leave extra blocking matter in the PC's chassis. Also, if you system box on the floor, those vents tend to clog over time. Also, be sure to act on act on problems swiftly. If you notice a lack of fan noise from your power supply or auxiliary CPU fan, make sure you replace the unit promptly to avoid overheating. If you notice problems cropping up soon after a power outage, a power spike might have damaged the CPU.